With the caveat that given the events of the past couple of weeks any French chicken having an off day will be automatically suspected of avian flu infection, multiple media sources (see also here) are reporting on a `probable’ outbreak in a poultry holding in Haute-Vienne. Testing is reportedly underway, and results ought to be known later today. Bird flu may have appeared in Haute-Vienne. A suspected case was detected in the east of the department. Analyses are ongoing. The results could be known in the late afternoon. The information of the Popular Center is, for now, not confirmed. After the Dordogne and the Landes, bird flu could have appeared in Haute-Vienne. A probable case was detected but it is not clear where. According to the Prefecture services, contacted the December 9, 2015, analyzes are underway whose results could be available later in the day. 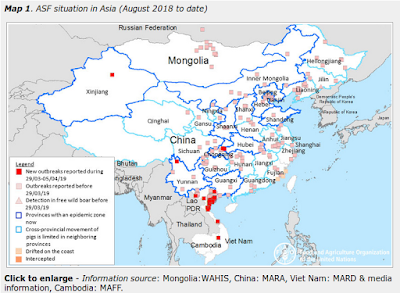 Frustratingly, a week after we saw HPAI H5N2 Bird Flu Detected In France, we’ve yet to see a characterization of the virus, and so we still don’t know if this virus is related to the Eurasian HPAI H5N2 or is another LPAI to HPAI mutation (like the one reported with HPAI H5N1 in late November). The French Ministry of Agriculture’s Avian Influenza: the current situation in France dated 07/12/2015 vaguely states. What is the situation in France? At this stage, three outbreaks were detected in the Dordogne. ANSES confirms the presence of highly pathogenic avian influenza viruses to poultry. This is a European strain evolved by mutation of low pathogenic form to the highly pathogenic for poultry. This is not an Asian strain, and it is not the Asian strain detected in the last few years. On December 7, 2015, following the detection of three outbreaks of avian influenza in the Dordogne enhanced surveillance was put into place on the entire national territory, including active surveillance of clinical signs avian influenza in the susceptible species. The abnormal mortality detected by farmers have also led to systematic sampling. Many are suspicions already raised but three new highly pathogenic avian influenza outbreaks in poultry have been confirmed, both in the Landes (guinea fowl and ducks) and Dordogne (ducks). Hopefully we’ll get some clarification on the lineage of the H5N2 reported last week, and on France’s more recent HPAI outbreaks, either from the French MOA or from an outside source like DEFRA or the ECDC.